February was a busy month, the heat has subsided a bit and everyone is in good spirits. We built a platform in the Nyala Berry (Xantocercis zambesiaca) tree in front of camp. This has now become prime real estate at midday. It provides a nice hidden vantage point from where to observe animals and birds down at the Limpopo River or just a pleasantly cool shaded hide-away. The bush is unbelievably green and gorgeous. The mighty Limpopo River is still rushing past camp at near full strength. This is still making trips into civilisation very tricky as we still have to do the epic journey via Martin's Drift border post which adds about 4-5hrs to our trip. The route runs along the Limpopo River and does prove worth it sometimes when plenty of Giraffe (Giraffa camelopardalis) might be seen or some other interesting mammals. Game Reserves, the frequency of poaching and snaring decreases dramatically. Everyone wins and volunteers get the opportunity to mix with the local Tswana people and get an idea of what living in Africa can be like. We are still soldiering on with research drives. The wildlife is rejoicing in all the good rains and all their offspring are growing well and strong. Our resident Leopards (Panthera pardus) are still eluding us. Their tracks litter the roads when we go out in the mornings, but still we haven't seen one this month. 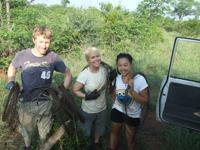 The visits to Makulu Makete and Venetia Limpopo Nature Reserve were as awesome as ever. Volunteers got very close to both Cheetahs (Acinonix jubatus) and to Lions (Panthera leo) with cubs. Elephants (Loxodonta africana) are still streaming onto Legodimo to everyone's delight and even stroll right up to camp where they drink from the swimming pool or pick out favourite chunks of our garden. We're not complaining. The last contingent of Mopane worms are growing rapidly and are making it look like winter because of the sheer number of them that consume more leaves than even the elephants do. Next month should start seeing the change of daylight length and the leaves of some of the trees. We are all looking forward to an eventful month of March as a couple of interesting projects are planned and Stuart Timson, the Peru Conservation Director, is due to visit.